What does a Steel Challenge Stage look like? There are five steel targets, or plates, per stage at various distances from 7 to 35 yards away. The plates will be either 10", 12", or 18" x 24" in size. All of the plates are relatively easy to hit, just hard to hit if you try to go too fast! One specific plate, called the Stop Plate, must be shot last. The others must each be hit at least once prior to hitting the stop plate. You can shoot the first four plates in any order. (Except on Outer Limits, but we probably won't shoot Outer Limits as it also includes movement). Each shooter makes five runs, or shot strings, on each stage. Your slowest run is thrown out, and your four best runs on the stage are added together. Your score is your total time to shoot all of the stages. We will be using Steel Challenge rules in Reno, with the exception that there will be no drawing from a holster. Instead, we will use the rimfire start position, which is with the gun pointed at a marker on the ground directly in front of the shooter's position and 12' away. It is a "Cold" range. ALL weapons must be unloaded at all times, unless you are in the shooter's box and under the direction of the Range Officer. That means concealed carry permit holders, too. If you are packing, Just drop the magazine, put it in your pocket, clear the chamber, and re-holster. No handling of weapons outside of the shooter's box. If you need to work on a weapon, there is a designated safety area close by. No ammunition allowed in the safety area. You can load and unload magazines at any time behind the line. You can shoot any handgun; revolver, semi-auto, or rimfire. If you've got a .22 you like, bring it along. Rimfire steel is a lot of fun, and is also usually the fastest category. Single action revolver? Sure! Bring what you've got. For obvious reasons, no armor-piercing rounds! You do not have to knock anything over, just hit the plates hard enough to leave a mark. If you load your own ammo, stick to relatively light loads, hot enough to cycle and feed reliably, but no more than that is needed. Please save your maxed out mega-blaster hunting loads for use on the rifle range on Friday. Any factory standard loads are fine, and Plus P's aren't needed. How much ammo should you bring? It depends on how many times you miss, but I'd figure on at least 150 rounds as a minimum. For a full set of the rules and a lot more information about Steel Challenge, check out the Steel Challenge Shooting Association website. We will have a brief shooter's meeting at the range prior to getting started to review safety rules, procedures, and range commands. Bangin' and Clangin', here we come. How about transportation? To the ranges, from and to the hotel, etc? From and to the hotel there is a free Silver Legacy shuttle bus and it's perhaps a ten minute ride. As to getting back and forth to the other GBR activities, in the past we have always had enough extra seats in various vehicles so everyone had a ride. Getting back and forth, however, is your responsibility. Ask around the night before at the hospitality room and make sure you've got a seat. In the worst case, three or four of you may need to pick up a rental car and split the cost. There is a car rental office a few blocks from the hotel, or you can arrange a car rental on line for airport pickup if you are flying in. How about lunch when we're at the ranges? The e-Postal matches are great fun, never the boring old concentric ring targets, and usually a LOT harder than they look, so even if you think you did rotten, send them in anyway, you probably will be surprised how you did! If you are driving up or down the Coast to get to Reno and the Gun Blogger Rendezvous, David at Random Nuclear Strikes has some good advice regarding routes and some areas to avoid due to local firearms laws. Be sure to check the comments too, as there's a lot more good advice there. One of the things I am trying to do is set up some charity events to support charities chosen for this year: Soldiers' Angels, Remind.org, and Fisher House. This is something new that I've implemented since taking on the job. More to the point, one of the charity events (and it may be the only one) is a charity shoot at/during the Expo. The original plans for this have suffered a bit of a setback. So, I would very much appreciate it if you or some others who live out that way could recommend a range (or two) near Las Vegas. The current plan is to hold a raffle at the event, and take 3-5 people out shooting with Team Blackfive, and a few other milbloggers, on Saturday. If someone can walk the talk, we will take some or all of the winners out in an armored scout car. The winners will get some class time before leaving, and personalized instruction at the event, one or more of Team Blackfive having been SF weapons instructors. I hate to impose on you, but could really use the help in locating a good and friendly range, pref. one with reasonable rates (or that might be willing to join in, sponsorships being low at this point). I saw in the news that a brand new shooting facility is going in in Clark County near Las Vegas, but it won't be available until next year. For this year's event they need to find something for a little shooting. They'd like to have at least 100 yards, and more would be better. Closer target stands would probably be needed too. The Pyramid range (Washoe County Public Shooting Facility) in Reno would be perfect, except it's in Reno, not Las Vegas. If you have any ideas and information on Las Vegas ranges, please leave a comment and help these folks out! From the NRA Article: "The mountainous terrain of the NRA Whittington Center in Raton, New Mexico served as the perfect setting for the seventh annual JP Rocky Mountain 3-Gun Match, held August 6-8. Nearly 200 competitors traveled to northern New Mexico to compete against some of the top shooters in the country." As I was reading down through the results I saw a familiar name at the top of the Heavy Iron class, Washington State's own Patrick Kelley. 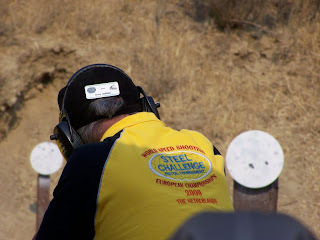 Patrick is also the match director for the Washington State Steel Challenge Championships, held earlier this year in Ephrata, Washington. Patrick takin' it to the plates at the Washington State Steel Challenge Championships. I can't remember the story behind this picture, but Patrick is a top notch shooter who hasn't forgotten that it's just a game, and it's supposed to be fun! Fun it was! Congratulations to Patrick on doing well in New Mexico, you done good! With the current political climate, just about all of the gun manufacturers are building everything they can as fast as they can just trying to cover back-orders. Considering that, it's even more of a credit to Kerby Smith and PARA-USA that they were not only able to come up with a to donate to the Gun Blogger Rendezvous, they were able to come up with a spectacularly nice example of their products, a "Gun Rights" high capacity .45, single action and in stainless to boot! Someone attending the Gun Blogger Rendezvous is going to be the proud owner of this beauty, and if you are going to be there it could be you. Of course, you DO have to buy a raffle ticket, or perhaps a handful of them, but considering the money raised goes to Project Valour-IT, it's a double-win! While KeeWee and I were down in California for the World Championships, one of the people we met was Molly Smith. 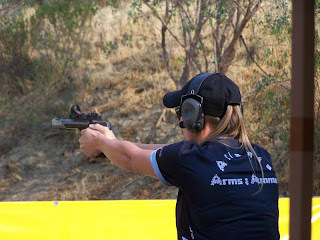 It turns out that Molly is not only a very fine pistol shooter, she is also a Gun Blogger. I was on the same squad as she was in Rimfire in California, and I can attest to the fact that she can shoot well! Her blog is The Molly Minute, and it is well worth reading. 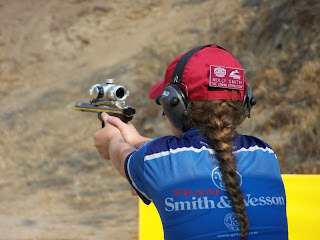 Her second post ever, on shooting "In The Zone", is definitely worth reading if you participate in any sort of competition, not just shooting. (Look in the January Archive to find it). Drop by and leave her a comment and let you know you enjoy her writing. After we got home from California I got an email from Molly inquiring about the Gun Blogger Rendezvous as she not only loves to shoot, she'd like to meet some gun bloggers and learn more about blogging. It turns out that Molly, her Parents, and her brother Steven will all be attending this year's Rendezvous! For those of you following the saga of Bun, our long eared furry family member, here's the latest. 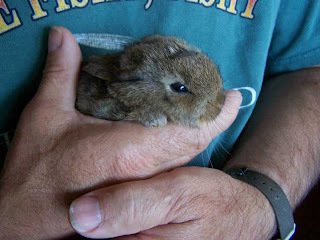 As you remember, we found him, or actually, he came to us, as a very small baby bunny with a badly injured left eye. He was not in very good shape, and even after "doctoring" him up a bit, I really didn't expect he'd make it through the night. To our surprise, he did survive, and has now fully healed up and appears not the worse for the injury. When we first got him, he was so small he fit in the palm of my hand, but now he's somewhere between two and a half and three pounds! It's hard to get a rabbit to stand still on a scale to weight him. He's (or she, we still don't know for sure) is eating like a horse, inhaling alfalfa, fresh veggies and rabbit mix at an amazing rate. Rolled oats are a special delicacy. I've been letting Bun run around in our bathroom to get exercise and to become more familiar with being loose in the house. He's litter box trained (mostly!) so we may soon be able to let him roam the house a bit, under close supervision, of course. Last night, while getting some exercise in the bathroom, Bun decided that the piece of plastic that had held replacement batteries for my camera would make a good toy. I've never seen a rabbit play with a toy like this before, and it was fun to watch how much fun he was having. Do I have to stay in the Silver Legacy Hotel, or can I stay somewhere else? The Silver Legacy provides the Hospitality Room at no charge to the Rendezvous and gives us a discounted group rate on rooms, but it is based on having enough people staying in their hotel. It has happened in the past where not enough rooms were filled by our group in the hotel and it ended up costing us some money. I paid it out of my own pocket, but I really prefer not to have to do it again! This year it looks like we are OK, but I haven't seen the final numbers yet. All Rendezvous financial considerations aside, to get the best enjoyment out of the Rendezvous, you really should be staying at the Silver Legacy. Folks who have stayed elsewhere usually miss out on a lot of the fun. The BS sessions go well into the night, and it's nice to be able to walk to your room. We usually eat most of our meals together at the various restaurants in the complex (there are 23!) and one of the highlights of the Rendezvous is getting to spend as much time with each other as possible. It really is a lot like a giant extended family reunion! Do I have to Register for the Rendezvous and pay the $30 Registration fee, or can I just drop in? If you want to stop by, you are most welcome. However, as a visitor rather than a registered attendee, you do not get any of the cool swag or door prizes. Every previous year attendees have gotten cool stuff worth far more than the $30 just in door prizes. By registering you also get to attend the All You Can Eat Pizza Feed on Saturday night put on by The National Shooting Sports Foundation. Steel Challenge shooting on Saturday, and the Cowboy Fast Draw Shooting on Sunday also require Rendezvous Registration. Since just about all of the $30 registration money goes to Project Valour-IT anyway, there's no reason not to register. Yes, you can, but since the number of door prizes is based on how many we know in advance are attending, you may miss out on some of the door prizes if we run out. You will definitely get some swag, though! If you are planning to register at the door, PLEASE email me ASAP, so we know you are going to be there. If you have any questions, please ask in the comments. 2:30 pm. Leave the Hospitality Room to car pool to Scheel’s Sports Store in nearby Sparks. 3:00 pm – 5:00 pm. Guided tour at Scheel’s Sports and browsing/shopping. Pick up munchies and soft drinks on way back to hotel. 8:00am. Leave the Silver Legacy Hospitality room, then downstairs to one of the restaurants for breakfast. Saturday Evening until Midnight: Refreshments and conversation at the Silver Legacy Hospitality room. Bring your own refreshments and munchies. .
7:30am. Leave the Silver Legacy Hospitality room, then head downstairs to one of the restaurants for breakfast. 8:15am. Leave for the Virginia City Camel Races Festival and Cowboy Fast Draw Blogger Match. 9:00am – 10:00am. Cowboy Fast Draw Shooting. The Cowboy Fast Draw shooting is the last scheduled event for the Gun Blogger Rendezvous, but many attendees will be staying Sunday night and returning home on Monday. The Camel Races Festival, The Reno Car Museum, the Downtown River Walk, the new Reno Museum, and a number of other things should be considered for the rest of the day on Sunday. Note that many of the times shown are departure times. Plan on being there a little earlier than the departure time. Several folks have suggested that I really need to sign up for Facebook, so I finally got around to it a couple of days ago. I identified some of the people I know there as friends, and sort of followed the instructions to make it "Official", kinda. That's about as far as I've got. I haven't figured out exactly how it works, or what you can do with it, or anything else about it, but at least I now have some friends. The way our flight worked out, KeeWee and I arrived at the hotel in Valencia early evening, so I didn't have any chance to get out to the range and do any practice. Since we arrived late, match registration was closed, so I had to be at the match range, just up the valley from Piru, California, at roughly 7am. Next year I am going to try to get there a day early to get in a little practice and get acclimatized a bit. 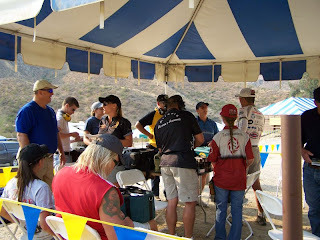 When we got to the range we walked up the hill to the registration tent to get signed in. While we were waiting for registration to open we ran into Nick and Ryan Leonard from Portland, Oregon. Nick puts on the annual Man of Steel match in Portland, and Nick's son Ryan is last year's and this year's national Junior champion in Steel Challenge. Gary Guy, USPSA Area 1 Rep., was running registration. Gary handed me the match envelope with the scoreing stuff and a current rule book. "Based on how you did last year, I'm putting you on Squad #2. ", he said, with a slight smile. (Note to self: When Gary has that smile, watch out!) "Oh? ", I said naively, "Who else is on the squad?" "Kay Miculek, Billy and Jessie Abbate, Randi Rogers, Jim O'Young, Tori Nonaka, Molly Young, Clyde Harrison, Jec Clark, and Ken Kupsch." It took a moment for that to sink in. "You're on the number 2 super squad", Said Gary, still smiling. My heart may have stopped completely, at least for a moment. For those of you wondering exactly what a Super Squad is, at high level matches where there is likely to be media present, they group the top shooters together into one squad that travel as a group from stage to stage. This makes it easy for the media to follow, photograph, and video the likely winners and top finishers. This squad will be made up of shooters like BJ Norris, KC Eusebio, Rob Leatham, Todd Jarrett, JJ Racaza, and other shooters of that caliber (terrible pun....). The number 2 super squad will be next fastest guys, and the fastest ladies in the world. 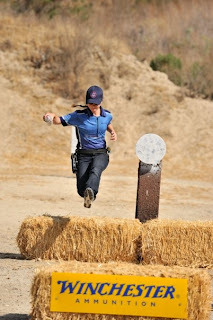 This time it would be the next fastest guys, the world's fastest ladies, and, well, um, me...... oy! Jim O'Young, Molly Smith, Kay Miculek, Jec Clark, Me, Randi Rogers, Clyde Harrison, Ken Kupsch, Billy Abbate, Jessie Abbate, and Tori Nonaka. 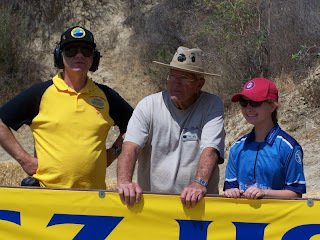 Me, "Gunnie", and Molly Smith, three generations of shooters. Kay Miculek and Jessie Abbate. We all assembled at the first stage and got ready to start the match. I have to admit that shooting with this group was definitely intimidating. These folks are ALL good! The good news is that I didn't have to shoot first. The bad news is that I got to shoot second, right behind Kay Miculek. Kay holds a number of Steel Challenge World Records for ladies! Truly a tough act to follow. Our first stage was "Pendulum", and I have always had reasonably good results, at least for me, on this one. I tried to go through my regular routine and let muscle memory do it's job, but a bit too much adrenaline, I think, and I shot my worst stage of the day. Molly Smith, 12 years old, and already an excellent shooter. Our second stage was Smoke & Hope, the fastest stage of all. Since I had not done too well on the first stage I kept it kind of conservative and tried to just get through the stage without any major mistakes. I did. No great times, but no penalties and I was starting to settle down a bit. In Steel Challenge each stage has a tempo to it. The better you are, the faster the tempo. With all of these really fast shooters on the squad it was a huge temptation to try to shoot at their tempo, rather than my own. After all, I CAN shoot at that speed, I just miss a lot! I could see that I needed to keep my adrenaline on a short leash and try not to make any big mistakes. As we moved from stage to stage I managed to settle down a bit, but not completely. There were a total of eight stages to the match. One of the most challenging stages is "Outer Limits" where you shoot two plates from one position, then have to move to a second position to shoot the last three plates. This is the one stage where you can absolutely destroy your score if you mess up. 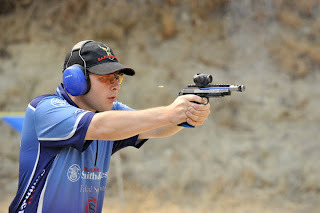 If you miss one of the first two plates you will have to come back to the first position and shoot it again then move to the second position to finish. a 4 or 5 second run turns into 7 or 8 or even worse, really easily. I figured if I could shoot relatively safe 5 second runs without any penalties that would be OK for me, anyway. I ended up with a 4.83, a 5.39, and a third run in the upper fives. Not quite what I wanted, but again, I didn't do any major damage, either! 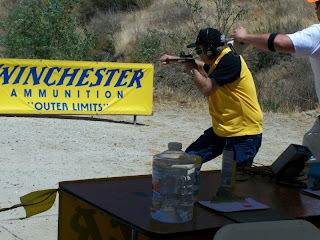 Running from the first position to the second, looking through the sight for the next plate so when I get into the shooter's box it will be a quick shot. 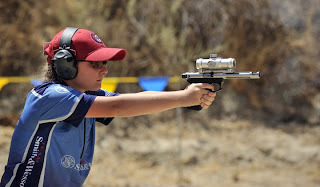 Jessie Abbate - Absolutely amazing shooting skills. She set five world records for ladies over the three days of the match. Tori Nonaka - Only a little slower than Jessie and Kay. Whew! As we neared the final stages I was starting to feel more comfortable with the pressure, although the heat was starting to get to me a bit. It was hot and dusty, and I don't see much of that at home in Washington. I actually managed a couple of personal bests near the end of the match. By the last stage I think I was just about out of gas, and the last stage wasn't too good, my timing was starting to fall apart and I had to take a few extra shots to get all the hits I needed. I had managed to complete the match without any penalties for missed plates, which is always a primary goal. The gun had run flawlessly all day. We gathered up our gear and headed for the rental car, it's air conditioning, and back to the hotel to cool off and was off the dust. A quick stop at a grocery store on the way scored a bottle of sports drink and an ice cream bar. They were both gone by the time we reached the hotel. That evening the rimfire scores were posted at the hotel. I hadn't shot the best I've ever done, but at least for me, I hadn't done too badly, either. I ended up 25th over all in rimfire, 22nd in the Optic sight class, out of 83 shooters. In our squad I had finished 7th out of the 11 in the squad. 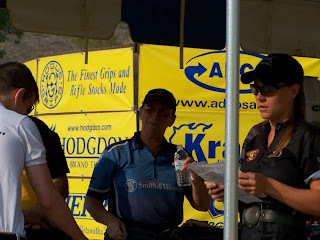 I had missed winning the Rimfire Senior Division by only thirty-nine hundredths of a second! Second place in the Rimfire Senior Division isn't that bad, though, and I'll definitely take it! 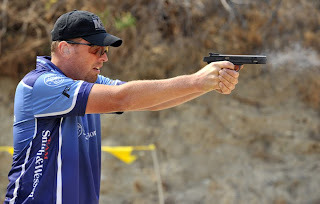 While I was down in California for the Steel Challenge World championships, I got a chance to talk a bit with Dave Thomas, the head of USPSA and Steel Challenge Shooting Association. Dave decided that since the Gun Blogger Rendezvous raises money for Project Valour-IT, a very worthy charity helping our injured Vets, and since we were going to be featuring Steel Challenge shooting at the Rendezvous, that the Steel Challenge Shooting Association would like to help out a bit by donating some door prize and/or raffle items to the Rendezvous. 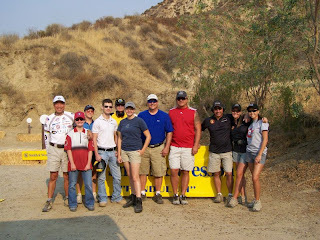 A big Thanks is in order to Dave Thomas, USPSA, and Steel Challenge for helping us out! 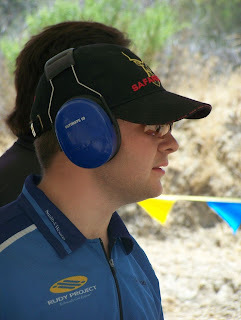 BJ Norris shooting and winning in Rimfire Optic Sight Class. BJ Norris - Also a Gun Blogger! 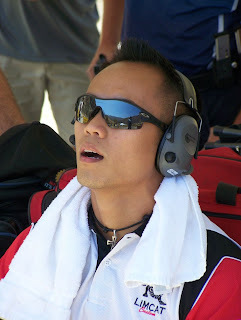 JJ Racaza - In the zone, or asleep, or something. Certainly not looking very stressed out! Lots more stuff will be posted later. All of the travel went exactly as planned. To give credit where credit is due, the TSA guys were excellent and professional, ticket agents, not so much, but no problems really. We got a Chebby HHR, which seems to be sort of a PT Cruiser competitor. It seems to drive OK, the air conditioning works well (YAY! ), and it keeps up with traffic. Horsepower doesn't exactly roll your socks up and down, but it's adequate. We grabbed a bite to eat once we got checked in, then I unpacked the stuff and set up the range bag for tomorrow. Tomorrow's the big day for rimfire and I start shooting around 8am. KeeWee and I have just about got everything all ready to go for our big annual adventure to Piru, California and the World Steel Challenge Championships. We catch the airport shuttle at 11am. today for the jhour and a half ride to the airport. I think I've got my #1 rimfire race gun, and High Standard with a Volquartsen barrel and a C-More sight, running reliably, at least I hope so. Just after I returned from the European Steel Challenge Championships a crack developed in the frame of my primary race gun and it had to be retired. I built up and modified another one, using many of the "tuned" parts from the broken gun such as the hammer, sear, and a few other bits, and used it in Coeur D'Alene for the Idaho Championships. It stove-piped a couple of times in Idaho, and clearly wasn't quite ready for prime time. Since Idaho I've done a bit more work to it, and particularly to the custom modified extractor I use. I shot it last Saturday at Kitsap's monthly fun steel match, and it worked perfectly. I've gone over it carefully and everything looks good. My backup race gun isn't quite as reliable, but it's running pretty well, too. Hopefully I won't have to use it. We fly from Seattle to Burbank, arriving around 6pm. We pick up the rental car in Burbank, then drive North for about 45 minutes to get to Valencia and the hotel. Tomorrow morning early I check in at the range, find out my squad assignment and start stage, then at 8:30am we start shooting. By early afternoon the match will be over, at least for me, as I only shoot in the Rimfire Optic Sight class. We'll probably hang around the match range for the afternoon and watch the fast (pro) shooters, and if there are any interesting side matches I might give them a try. By the end of the day we will both be hot, tired, and dehydrated, so we'll head back to to hotel to get something to eat and probably conk out early! We'll be at the range all day on Friday watching the shooting and checking out the vendor's booths. Friday night The is the NSSF banquet at the hotel, where we'll get a chance to sit and visit with a lot of folks we haven't seen since last year. Saturday morning we'll probably head out to the range for a couple of hours in the morning, then head back to the airport, turn in the rental car, and fly back to Seattle. From Seattle is back to Whidbey Island on the Shuttle bus, arriving home at approximately 00:30 Sunday morning. Sunday I plan to sleep all day! I'm taking my netbook with me, so, hotel WiFi willing, I will try to post a progress report or so over the next few days. I've got some more great news about the upcoming Gun Blogger rendezvous. On Sunday morning at the Rendezvous we have been planning for some Cowboy Fast Draw fun under the watchful eye of Quick Cal Eilrich, the head of the Cowboy Fast Draw Association and multiple Cowboy Fast Draw National and World Champion. We were going to do it out at Cal's place, but those plans have changed. We are now going to be having our mini fast draw match at Virginia City as part of the Virginia City Camel Races Festival. Yes, Cal will be there showing us how, and we'll all get to "Shoot it out" Sunday morning in Virginia city. The rest of the day we can check out the festival and watch the camel races. Sunday is going to be a lot of fun! Here it is Friday night and the entire week went by in a blur. The Gun Blogger Rendezvous is barely four weeks away, and if you've never put on an event like this, you have no idea how many loose ends keep popping up. It seems like you get one thing sorted out and there's something else right behind it. 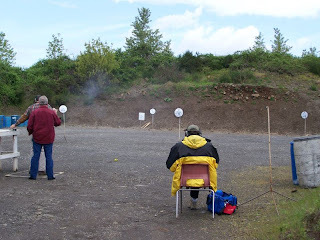 Anyhow, tomorrow I'm heading over to the Kitsap Rifle & Revolver club to shoot in their monthly Fun Steel Match. If you are anywhere near the Bremerton/Silverdale, Washington area you ought to swing by and give it a try. No matter how much you practice, there's still nothing like a real match for improving your shooting. Next Wednesday KeeWee and I are off to California for the World championships, and I really need to get my shooting in order. There's not much time to get it working, either. And the bunny? 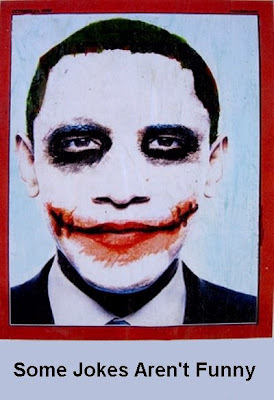 He's (?) doing well, growing like crazy, and eating like a horse! His injured eye seems pretty much normal, as best we can tell he's got good vision in both eyes. I'll have to take another picture soon so you can see how he's grown. He's sort of picked up the name of "Bun", and he seems to know his name. When you speak his name his ears pop up and he seems to know you are talking about him. I've got the race guns cleaned and ready to go, the range bag packed, the alarm set, and it's time for an early shower and off to bed. In spite of efforts to shut down our Fund Raising Raffle for Project Valour-IT , raffle tickets are now available. Thanks to the hard work of a number of people, and particularly to Brian of Lucky Gunner Ammo, Lucky Gunner is now providing us a shopping cart and ticket buying process on their website. Brian put in some long hours after his regular work day to make this all happen. What are they getting out of this? Nothing! Every penny, less the 3% processing fee by the credit card processor, goes directly to Project Valour-IT. Of course, while you're there you might browse through the ammo they have in stock and see if there's a good deal on whatever you might be getting low on. Gunnies REALLY ARE the nicest people. Have you ever found yourself in need of a small pin pinch to drive out a small roll pin and nothing you've got on hand is the right size? Yeah, me too. Usually it's in the middle of the night and the hardware store is closed, so you can't go buy a punch the right size, that is, even if the right size happened to be on the shelf. Start out with a small screwdriver set like these. This set was a buck in the dollar department of the hardware store. Clip off the swivel top with your side cutters. Clip off the screwdriver bit end too. Square up the tip on the bench grinder. Square up the "Hammer" end too. Finished set of pin punches. As you would expect, these are still CHEAP punches, and I would highly recommend ordering yourself a good set of gun punches from someplace like Brownell's, but in a pinch, these will usually get the job done. A tip of the Stetson to Michael Bane, where I found the original. No idea who did the original artwork, so unable to give credit until I find out. It seems like no matter how hard I try, sometimes I just run a few days late and often many dollars short, to mangle an expression. Anyhow, this month's e-Postal match, ably hosted by Curtis Lowe at his blog of the same name, is underway. If you missed out on last month's match, don't let that happen to you again. Go download the targets NOW, and shoot the match early instead of waiting until the last minute and then missing out entirely. Sailor Curt, proprietor over at Captain of a Crew of One and host of the match just completed, has got last month's results posted HERE. If you've never tried one of these e-Postal matches, you've got to give it a try. No boring old concentric circle targets in these matches, No Sir! Every match will give you a good test, and it will be on a target and scoring system different than anything you've ever seen! What do you get if you win? Nothing! 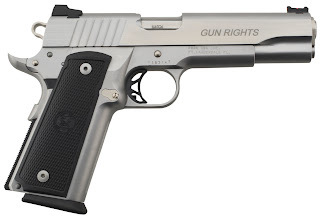 It looks like we've managed to come up with a way to get the raffle ticket sales for the Gun Blogger Rendezvous/Project Valour-IT effort back on line, and it should be up and running tomorrow morning. Check back tomorrow for the full info and the link to take you to the raffle ticket sale page. In the mean time, why not go have a look at Lucky Gunner Ammo and see if they have some of that ammo you've been looking for?. Why am I mentioning Lucky Gunner Ammo in a post about the Rendezvous raffle? Well, it looks like a lot of the credit for getting the raffle's on line ticket sales going again will be earned by the Lucky Gunner folks! Thanks, Guys!